I’ve heard several people recently talk of the “politics of untruth”, as if things have moved into a particularly surreal space in the age of Donald Trump and Boris Johnson. What happens when truth disappears? Are there unconscious things drawing people to vote in a way that makes life worse? The crude answer is that people believe what they need to believe, which is not primarily about logic. The assertions that EU membership costs £350 Million per week and that Turkey is about to join the EU bringing mass migration have been thoroughly discredited. The fact that people are still believing them says a great deal for people’s needs and fears. Working with unconscious fears is also core territory for psychoanalysis. One of the insights of the analyst Melanie Klein put forward from her work with children is that the world is a bewildering place to a small baby. She coined the term “paranoid schizoid position” to describe this, and talks of it as a position rather than a stage because she thinks in terms of people adding additional, more sophisticated, ways of functioning on top of this. At the level of the paranoid schizoid position things are fragmented — Klein talks of “part objects” — making it hard to have a balanced sense of oneself or of the whole situation. Losing sight of “truth” in the debate feels as if we the debate has regressed to that paranoid-schizoid level. Others have written about the way leaders sometimes emerge not because they have great qualities, but because they act out other people’s anxieties. The suggestion is that paranoid schizoid material is around when a group suddenly picks someone as its “leader” or a paid to exercise leadership as if doing something on behalf of the group. 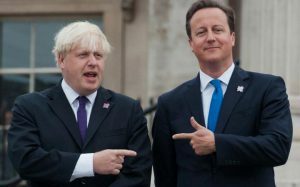 The way the referendum debate at times feels as if it is something between Boris Johnson and David Cameron makes sense in terms of that sort of pairing. Boris Johnson claiming that the EU was about to ban bananas being sold in groups or more than three was talking nonsense, but was getting in touch with fears of people who assume the EU is alien and dangerous and makes sense as him taking on that sort role as the leader holding unconscious anxiety. Respected figures worldwide seem to be queuing up to urge the UK to remain in the EU, but they are talking at a more sophisticated level that misses this visceral feelings and is not heard by the frightened. A disconcerting example was the way Nigel Farage responded to Barack Obama’s support for Remain by arguing that, if the major world leaders are saying we should stay, that is an argument to leave: it’s an argument that prioritises fear over wisdom. The analyst Jacques Lacan spoke of “the neurotic who enjoys their symptom” and the way this leads to people resisting things that would improve their lives. My sense is that this is about the ways people to find to cope with difficult situations and stories they tell to make them bearable. Change involves letting go of the coping mechanism (which they feel has worked) without certainty that things will improve: it can feel like throwing away the crutches before you know you can walk. An example might be the person who sees an expensive restaurant and thinks “That’s not for the likes of us”, which is a way to make it feel OK that someone feels they can’t afford to go in. What is chilling about this is that unconscious anxieties often get worked out in ways that contain the anxiety without improving the situation. An example from the General Election campaign is someone who told me that austerity was making things very difficult for them, but then blamed “immigrants” for this, and were going to vote Conservative because they were “tough on immigrants” — which actually meant they were voting for the party promising more austerity. This was in a constituency where minority ethnic groups are around 2.5% of the population, but they didn’t seem to register that they were blaming rather a lot on so few people. In reality, Brexit is a giant leap into the unknown. Yet it is being spun as “taking our country back”. The sense is that it is a safe return to how things were, undoing some threatening changes. So all the unconscious resistances to change are reasons to resist being fully involved in the EU. That means a vote for “Leave” meets an unconscious need to keep things bad. We have an ageing population and in purely economic terms need immigrants to fill the gaps, particularly at the younger end of the workforce. Immigrants pay much more in tax than they receive in benefits: in economic terms, we need them. An “economic migrant” wants to come and work: this is a good thing. On top of this, we are seeing significant instability in the Middle East, particularly Syria, and can expect global warming to make this worse. We brutalise ourselves if we don’t respond to that need in a humane way, and fuel the tensions that lead to conflict — whether that is terrorism or outright war. This is hardly figuring in the debate, but it is radically re-shaping our lives. Immediate examples include the Indian firm Tata Steel buying what was left of British Steel, and its present difficulties because of Chinese steel exports. The single market was created because it helps businesses to have a large domestic market. At the time the USA had a population of 270 million, and Japan 110 million, both much larger than any individual EU nation, but an EU single market of 450 million people gave huge advantages. Today, China and India are growing rapidly, with populations of 1400 and 1300 million respectively. That is changing things. People have blamed Gordon Brown for the recession that began in 2008. That’s unfair. It was a global slowdown, so the grumble should be that the UK economy was not in a better shape to weather it. The real loss of sovereignty is from nations becoming more interconnected. This is a pressing case for working with our European neighbours. One of the ways in which the EU is remarkable is that there is democratic oversight of the single market — if we leave because we want “sovereignty” we end up having to comply with the single market rules in order to trade with the EU but have no influence over them. That would leave us forced to comply with rules from Brussels over which we have no control — Brexit would put us in the position that the proponents of Brexit claim we are in now. On the doorsteps I have heard people say “we won two world wars: why should we give in now?” It’s a convenient and proud story, though it overlooks the extent of American help, and the natural barrier of the sea. Our European neighbours all had the experience of fighting on their streets in the Second World War, which fuels their urge to make sure this doesn’t happen again by building connections. Surely we should join them in that. This doesn’t mean that Brexit would throw us into a re-run of the last world war, but it makes sense to stand together ahead of future shocks, whether driven by political instability in the Middle East or global warming. On the domestic agenda, EU membership created the context for the Good Friday agreement that brought peace in Northern Ireland: if we have to have border controls we are asking that to unravel. But in the UK we elect a parliament to make our big decisions. In the referendum we have taken on ourselves the most important decision for at least a generation. It is hard not to read that as not trusting our own democratic system. What we are doing instead seems to be to grasp after half-truths and false certainties to frame the referendum debate and putting our unconscious anxieties in the driving seat. That sounds more like mob rule than democracy. Right now, with the referendum debate seeming to keep lapsing into a Tory leadership contest, David Cameron is ill-placed to do this. Instead, the last few days have seen attempts by some of the loose canons on the Tory back bench to trigger a leadership contest. They are unlikely to succeed, but do undermine his authority. I am not saying this simply because he is campaigning to remain in the EU: if the authority of the Prime Minister is also being attacked, the one remaining source of stability is the Queen, who holds that place by explicitly not having become involved in the debate. In a psychoanalytic context people talk of “containment” — of putting things in place around the analytic work so that difficult things can safely be engaged with. At the moment it feels as if the things that might offer containment are almost all being challenged which throws us into the sort of chaos that makes a wise decision much harder to reach. What is particularly striking is that none of the main political parties are in a healthy place to fight a general election, but the Conservative majority is so small that it would only take a handful of defections, abstentions or resignations by disaffected Tories to precipitate a general elections soon after the referendum. That feels utterly chaotic. Paradoxically it may be possible because the stability brought by EU membership has limited our sense that things can go horribly wrong — which is not a good time to think about leaving.